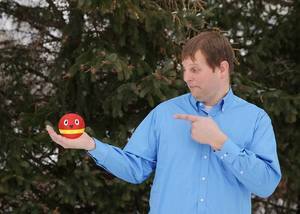 He may be a small red ball, but George’s story is planning on reaching a big audience. “The message really transcends all ages. They [children] can really grasp the whole story at a young age. They can see themselves in George and follow him the whole way – and, it’s the hope, that it resonates with their experience,” he said. Growing up in Southern Minnesota, Vreeman was surrounded by books from an early age. His mother, a librarian, helped guide his literary journey by providing him access to a variety of books as a young child. Fast forward to today, books and encouraging reading has continued to play a key role as a stay-at-home father of two young girls. Two years ago, he was inspired to write “The Ball That Did Not Like to Bounce” and began making strides toward publishing his children’s book – which became available to the public in May with the assistance of Beaver’s Pond Press and the book’s illustrator Tou Yia Xiong. Through his book, Vreeman is helping kids learn about accepting our differences. For more information or to purchase “The Ball That Did Not Like to Bounce”, visit http://www.brandonvreeman.com/ or find him on Facebook or Twitter.